Touring Car (TC) – The Touring Cars were limited to an engine displacement of 2.8-liters. Vehicles originally equipped with turbocharged or supercharged motors were also homologated for the series. The class was split predominantly between front wheel drive cars from Acura, Honda, and Mazda and the rear wheel drives such as the BMW 325i. There were twelve-race weekends during the 2008 season – ten races for the two categories. The Touring cars did not compete at Long Beach, Belle Isle or New Jersey. 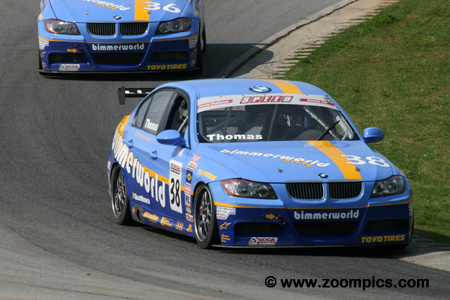 However, they raced at Virginia International Raceway and twice at Lime Rock Park. As in 2007, the opening round was held in March at Sebring, Florida. The championship ended in early October at Road Atlanta. 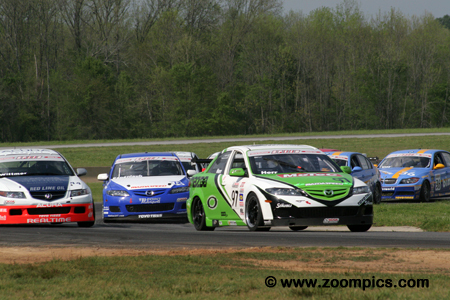 In late April, the Touring Cars competed at Virginia International Raceway as a support event for the Grand Am series. Seventeen entries raced for twenty-one laps around the eighteen-turn 3.270-mile road course. Pole-sitter, Chip Herr leads the field of seventeen starters into turn three on the first lap. Immediately, behind Herr is third place starter, Kuno Wittmer in the RealTime Racing Acura TSX and the No. 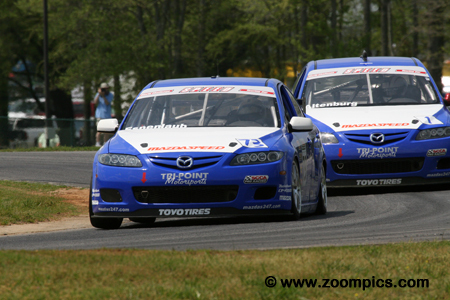 73 Mazda 6 of the second fastest qualifier, Charles Espenlaub. Herr would remain in the lead for the opening ten laps before making an error in the first turn. 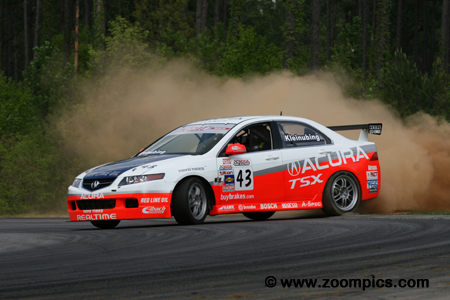 The RealTime Racing Acura TSXs swept the top-three spots in the first practice session. Third quickest was the No. 44 driven by Kuno Wittmer. But in qualifying, Wittmer was faster than his teammates and started third on the grid. At the beginning of the race, he jumped into to second and eventually took the lead when his teammate, Pierre Klienubing slid off the course. Despite pressure from Seth Thomas, Wittmer was able to score his first World Challenge win. Seth Thomas started in the seventh grid position. By the mid-point of the contest, Thomas had caught the lead group and moved into second place. His jump of five positions earned him the ‘Sunoco Hard Charger Award’ for advancing the most positions during the race. 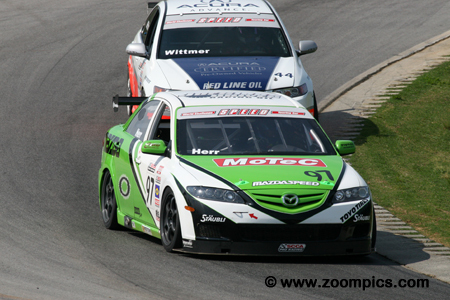 Thomas drew alongside, race leader Kuno Wittmer on a number of occasions but could not make the pass. At the finish, Thomas was in second – just 0.090-seconds behind Wittmer. Qualifying in the sixth starting position was a local driver, James Clay. 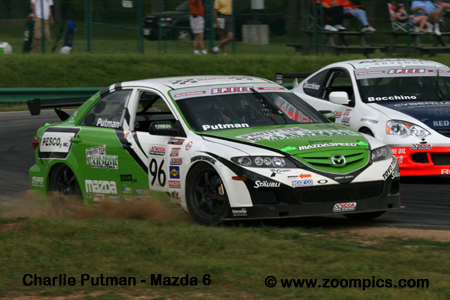 During the race, Clay battled with the Mazda 6 of the second fastest qualifier, Charles Espenlaub and the Acura TSX of Peter Cunningham. He was able to overtake these drivers along with pole-sitter, Chip Herr. Despite pressure, in the closing stages, from Espenlaub and Cunningham, Clay grabbed the final spot on the podium. This equaled his best result to date. The series had not visited VIR in six years. 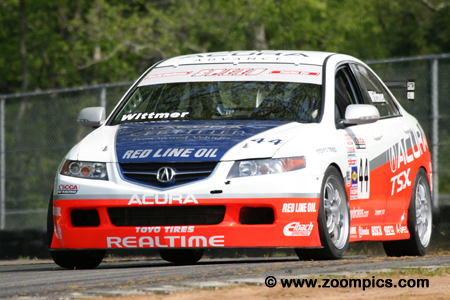 In 2002, Pierre Kleinubing set the fastest Touring Car time. In this year’s first practice session, Kleinubing logged a lap over six seconds quicker than his previous record. At the end of the qualifying session, he was fifth fastest. During the race, Kleinubing inherited first when the race leader went off course. He led for seven laps before going wide at the ‘Oak Tree’ turn - Kleinubing finished seventh. Chip Herr driving the No. 97 Tindol Motorsports Mazda 6 qualified on the pole. At the start of the race, Herr jumped into the lead. For the first ten laps, he led a pack of four cars which were separated by less than a second. Heading into the turn one on lap-11, Herr went wide and was overtaken by Pierre Kleinubing, Kuno Wittmer and Charles Espenlaub. At the checkered flag, Herr was fifth. Sharing the front row, with the fastest qualifier, Chip Herr, was Charles Espenlaub in the No. 73 Mazda 6. At the start of the race, Espenlaub was overtaken by third fastest qualifier, Kuno Wittmer. By the mid-point of the race, he had been passed by Wittmer’s teammate, Pierre Kleinubing. Errors by Herr and Kleinubing allowed Espenlaub to finish in fourth place. 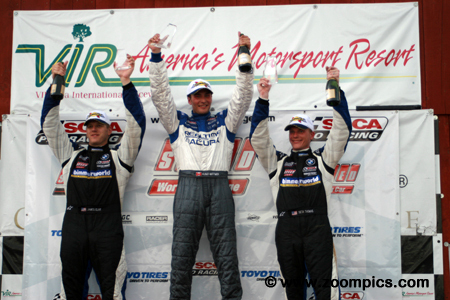 The round two World Challenge Touring Car podium at Virginia International Raceway. All three drivers on the rostrum equaled or had their best results to date. 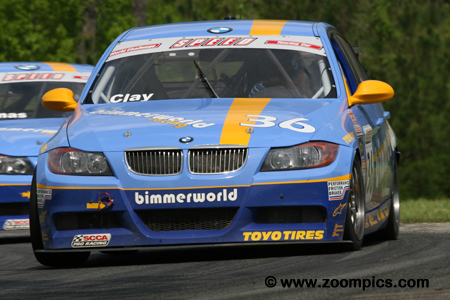 On the left is BimmerWorld driver James Clay whose third place matched his best results in the series. Standing on the opposite side, scoring his highest place finish in the championship is runner-up, James Clay. In the center is Kuno Wittmer who scored his first World Challenge victory.